The single most important thing you can do with a new puppy is crate training. 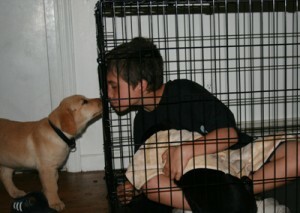 If you can make your puppy love his crate, you’re well on your way to having a great family pet. If not, be prepared for your living room rug to suddenly develop new stains and odors. The crate is also a very important tool in helping you manage your dog’s behavior until is he is a well-trained pup. So, just how do you get your new puppy to love his crate? The first thing is to commit to it from day one. Do not put a new puppy in your bed or you’ll never get him out. To help your puppy learn to love his crate, you want to make his crate a comfortable safe place. For a brand new puppy, I would hold off on the Orvis dog bed until you can trust your puppy not to eat it. In the beginning, an old towel does just fine. "Really kid, it's for your own good." Location is another key point. You want to place the crate in a central location in your home where the puppy can be near the family. You also want it nearby so you will use it. Usually a kitchen or family room is a good place to put the crate. If you want to have a crate in the bedroom for nights, that’s fine with me. Just make sure you have a crate in the main area of the house as well. Inside the crate, I like to have one or two things for the puppy to chew on or play with. In the beginning, be careful not to put too many things in the crate because there is a high likely hood of them being urinated on. Introduce your puppy to the crate by tossing a couple of treats into the back of the crate. Let the puppy wander in after the treats and close the door. Let him back out after a minute or so and then repeat. I like to shake the treat bag before I toss the treats in the crate. The puppy learns to come running to the crate when he hears this sound. For the next month, every time you put your puppy in the crate, toss one or two treats in the back. You’ll soon find you new puppy coming in the house and running to his crate. At some point, you’re going to have to leave your puppy in the crate for longer than he will like. He will most likely start whining a little or even giving a little puppy bark. What you do when he starts whining will determine your future success. Never let a whining, barking puppy out of the crate. If you do, you’re teaching him that in order to get out, he has to whine for an extended time (usually at night). In the beginning, your puppy may have an accident or two in his crate. Don’t worry; you’re not setting the puppy’s development back. He is just learning how to hold it. Don’t forget, the reason you’re using the crate in the first place is so he isn’t going to the bathroom in your house. I would much prefer my puppy pee in his crate rather than in my living room. Most puppies catch on to the crate pretty easily. In order to make this task easier, make the crate comfortable, have something for the puppy to do in the crate and use it often. You’ll have a much better behaved puppy for it.